Me and my grandma had the best time with Gamme! 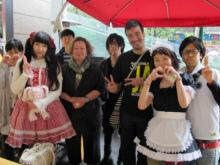 :) She was such an easy person to get along with, and she made our experience in Akihabara one to remember! Thanks again for everything Gamme!! Gamme does her best to tailor the guide based on your interests. Her guide was very informative and she is very attentive. She stayed on our tour 30min more than she needed to. Definitely recommend! My girlfriend and I were quite overwhelmed when we first entered Akihabara, as there were so many places to explore, very few of which were clearly labeled. Fortunately, Gamme was there to help us! She took us to many places where rare figurines, retro video games, and other interesting collectibles were located, as well as a maid cafe (where we had fun, though the food could have been better). Overall, I would highly recommend this tour, especially to newcomers to Japan, as Akihabara can be quite overwhelming if you cannot read Japanese. Essentially this is a shopping tour, but Gamme is such a sincere and lovely person that she'll bespoke the tour for whomever she meets. If you're interested in history or geography of Akihabara then this isn't really the right kind of tour. You won't be disappointed, but it just won't satisfy that kind of intent. Nevertheless we had a great time and would recommend it for anyone that wants to find their inner geek!